Last month I was incredibly privileged to be invited to see how a primary school in Ipswich is embracing a kitchen garden project, supported by the Jamie Oliver Foundation. This school is not just dabbling in growing a few vegetables but is working hard to incorporate running and maintaining a real kitchen garden that provides their dedicated Classroom Kitchen with fresh produce to cook with…and all done by the children at the school. It is an inspiring project that engages children in ‘hands-on’ activities, from the obvious sowing and hoeing to expanding their knowledge about vegetables … to recognising when things are ripe for harvest and the oodles of benefits that eating fresh, home grown fruit and vegetables brings with it. 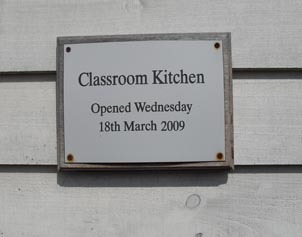 All this is then followed through into the purpose-built Classroom Kitchen where the children learn how to prepare and cook their school-grown produce. Having young children of my own who attend a lovely primary school, also trying to make growing food more integral to their teaching, makes this project very interesting to me. 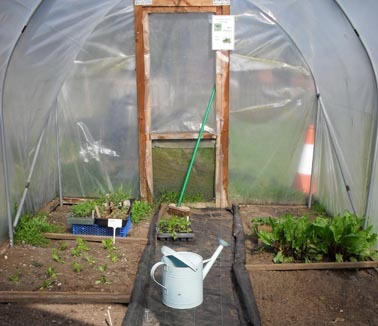 Squeezing in duties to create a successful kitchen garden in between teaching classes is no mean feat and I was intrigued to find out how this is achieved at the pilot school. Linking activities involved in gardening and cooking to the curriculum seems to be key; and there is relevance on so many levels. Literacy for example: reading and following instructions on seed sowing; researching what fruit and vegetables to grow using reference books and the internet; writing plant labels. Numeracy: following instructions on planting depths and spacings in cms and inches; writing dates on labels; measuring out quantities in g/kg etc. Science: simple plant biology; the role of the bee and other insects and the importance of pollination…etc. 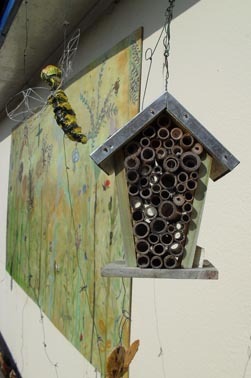 Art and Design: sensory elements within the garden, textures, colours, patterns, creating outdoor artwork to enhance the garden/micro-climate eg murals, buntings, insect boxes…etc. It all makes perfect sense and gives a practical side to so many aspects of the school curriculum. 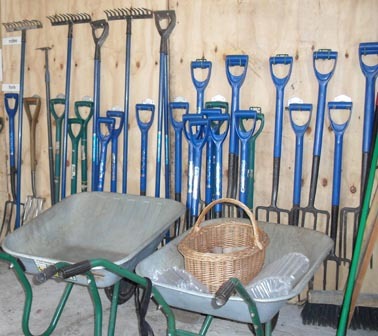 It is this relevance that has inspired the Headmaster at the pilot school to dedicate one morning a week off timetable to spend on gardening, cooking and other activities. A teacher takes the role of Garden Specialist who is responsible for co-ordinating the vegetable growing and a dedicated Kitchen Specialist, supported by the Jamie Oliver Foundation, takes on the role of teaching the children to cook. 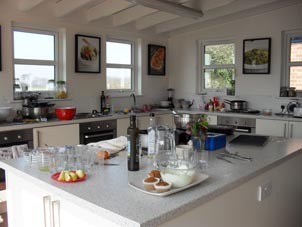 Other schools in the area are also invited to visit and take part in the Classroom Kitchen sessions. During my visit a group of eight children [aged 7] spent the morning preparing and cooking their own dinner…all being filmed for a resource video about the project by Fresh One. On the menu, home made salmon fishcakes, roasted carrots, roasted potatoes with rosemary and pumpkin muffins. It’s a long time since I was in a school cooking class… but I remember I was much older than 7, probably more like 14. It was wonderful to see such young children getting to grips with peeling and cutting, cracking eggs and weighing…and to see them all sit down, outside [the sun was shining] and tuck in to their own-made dinner! Perfect. They all tried their food [bar one who insisted he had to eat his packed lunch]…and a few did clear their plates. Another group of children were working through the vegetable beds, weeding and creating drills to sow beetroot. The school doesn’t have expansive grounds by any means, in fact it is quite small but manages to make the most of every available space. 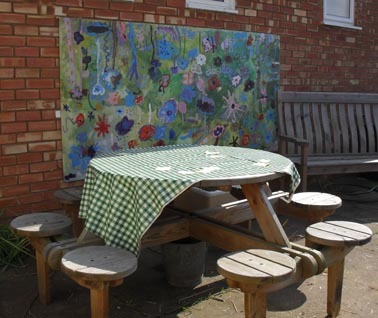 There are lots of simple wooden raised beds, fitted in all around the school buildings. 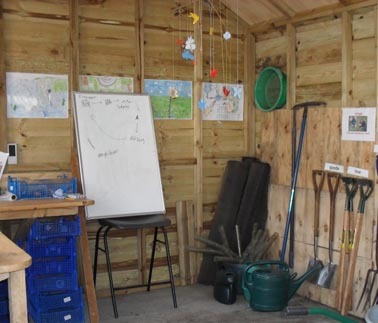 There is a polytunnel, compost area, tool shed, a sensory garden with willow tunnel, perennial borders, herbs, water rills, weather station and lots of colourful artwork…and they keep a few chickens too! It is a remarkable project that is proving to be invaluable for the school’s learning experience. The project has already seen a positive impact on children’s self-esteem and has given them a greater sense of teamwork. These life skills have transferred to the classroom, increasing their motivation to learn and improving peer relationships making a much happier school environment. Jamie Oliver’s Kitchen Garden Project has a big vision: “To get food education back on the primary school curriculum and for every child in the UK to have access to a kitchen garden project by 2022”. They are keen to work with like-minded people and organisations to make their vision happen and to help change the future health and success of our children. 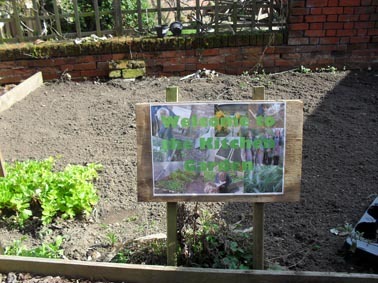 You can find more information here on the Jamie Oliver Foundation Kitchen Garden Project website. I’d just like to say a big thanks to Michelle for inviting me to visit, Kate for putting up with me in the Classroom Kitchen and to everyone else at the school who made me feel welcome. Keep up the inspiring work. 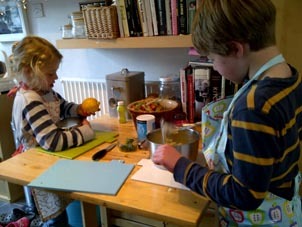 In the meantime, I have myself made more of an effort with my two children in the kitchen and at our newly acquired plot. 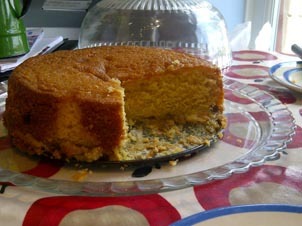 We spent the weekend sowing garlic, early peas and beetroot followed by a mammoth cooking session…we had to do the salmon fishcakes with roasted veg but followed with home-grown rhubarb and custard cake. The kids loved it.